When it comes to deciding your next stained glass investment for your Kansas City home, it’s pertinent to understand the underlying differences and advantages between pre-made and custom made stained glass. Both options have a lot to offer– stained glass can increase home equity, elevate curb appeal, double as a privacy solution, and much more. Here in lovely Kansas City and across the country for that matter, the 100-year mark for many stained glass windows is upon us or fast approaching. This is because a myriad of stained glass windows were built shortly after the turn of the century. So it is about this time that stained glass, barring any problems due to accidental breakage or shoddy craftsmanship, will begin to need repair or restoration. If you own an older home in Kansas City area and you have stained glass windows, it may be time to consider having your antique stained glass restored by a professional or at least inspected and cleaned. At the very least, perhaps it is time to take a closer look at it and see if the telltale signs of needing restoration are present. 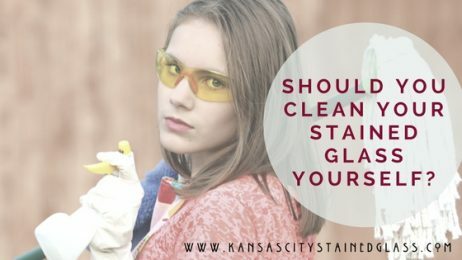 Below are some signs to look for on the stained glass windows in your Kansas City home to tell if it may be in need or repair or just a thorough cleaning. Many people don’t realize that stained glass is a very durable material and relatively immune to natural deterioration from aging. American glass is extremely stable because of the composition of the glass when it was created last century. However, this does not mean the glass can never be damaged and time will always tarnish it. Some very apparent signs the stained glass in your home needs repair are things like scratches, chips, and abrasions–which also take down its clarity. Chemical agents and smog also build up on your glass–making it look old and dingy, so if your glass looks cloudy, this is probably why. Other signs of more deterioration tiny cracks or chips. Of course, broken panels are a sure-fire sign your glass needs professional help and should be dealt with promptly because they can lead to much worse problems or failure of the glass. If your stained glass has broken glass or missing panels, it is absolutely time to have it restored, because more damage is imminent. The most serious way leaded stained glass breaks down is through the skeletal structure that holds the glass in place. This is when the frame itself or the leaded caming holding the pieces of glass together is rotting, deteriorating or sagging. This means frames are approaching total failure and they look bent or saggy. You need to fix it right away lest it totally collapses. When caming starts to fail, you will see missing, bent or broken pieces and more than likely cracking on the glass near or connected to the frame. This type of damage absolutely should be addressed because the stained glass, in this condition, could easily fall out from just a strong wind or vibration. Even though stained glass typically needs to be repaired or restored around 100 years of age, sometimes very old stained glass, is perfectly fine In fact, it may just need a deep and thorough cleaning by a professional. Happily, this is a relatively inexpensive procedure and which will bring it right back to its original shine. The reason stained glass gets so dirty is environmental; soot and grime build up on both sides of the glass from things like pollution, smoke, and oxidation. The reason it is critical to have a professional stained glass company clean your glass is because aggressive cleaning or cleaning with the wrong chemicals will cause damage and it could even permanently affect your glass’s transparency or shine. Regular cleaning is also necessary to avoid build-up of chemicals or air pollutants which could lead to long-term damage as well. Contact us at Kansas City Stained Glass to have your stained glass inspected by a true professional today! Looking for ways to spruce up your kitchen? Stained glass can make your Kansas City home and kitchen shine! Incorporating stained glass into your kitchen decor is a great way to give your home a high end look. Just like a precious stone, stained glass looks classy and sophisticated. It’s a great way to give your kitchen a touch of glamour and stylistic intrigue. Kansas City is renowned for its beautiful, traditional stained glass features throughout the historic buildings and homes. Stained glass can often times be associated with antiques, displaying religious and heritage symbolism. Older pieces of stained glass can definitely be associated with all the different art movements, featuring different time periods in art. Modern stained glass is still up and coming, usually underestimated for its versatility and flexible medium. Kansas City architects and stained glass artisans are starting to incorporate modern stained glass into their commercial buildings and homes. Kansas City residents agree that the local art scene is thriving and vast. Locals definitely have an appreciation for aesthetics and are always looking for a way to make their Kansas City homes stand out. Have you been considering stained glass but aren’t exactly sure where the perfect placement would be in your home? Here’s our top five favorite places to install stained glass in any Kansas City home; we hope to inspire you on your next renovation! Kansas City Homeowners, are you looking for a privacy solution to your bathroom that doesn’t include blinds? Tired of that moisture ruining the curtains or drapes in your Kansas City bathroom? Are you looking for an element of added elegance as well? Leaded and beveled glass windows are the solution for your Kansas City bathroom! Why Leaded & Beveled Glass Windows for Your Kansas City Bathroom? Leaded glass, often refers to clear, textured stained glass, offers the best privacy solution for your Kansas City bathroom. Leaded glass blocks out all unwanted views, giving you and your family comfort in your own bathroom. Another wonderful advantage of leaded glass is that it allows all that beautiful Kansas sunlight into your bathroom! No need for tacky blinds or mildew covered curtains, leaded stained glass gives you both privacy and that touch of elegance. Beveled glass, a clear glass that is ground and polished around the edges, gives a prismatic effect as well as a rainbow effect whenever sun shines through the glass. Beveled glass is frequently used in combination with leaded glass to create a beautiful, timeless look, perfect for really making your bathroom into an oasis. Beveled glass also blocks unwanted views, making it the perfect privacy stained glass combination! Kansas City homeowners agree that elegance is key for any bathroom decor and design. Leaded and beveled glass are the perfect addition to your Kansas City bathroom, there’s no other window options that possess sheer beauty and elegance like this one. Stained glass windows gives every Kansas City homeowner the opportunity to create a custom piece of art and the ability to really curate the theme of their home. With temperatures headed into the low 40’s and 30’s this week, the weather outside is becoming quite brisk in Kansas City. It won’t be long now until the winter arrives and soon after that, the holiday season will be here as well! Now’s the perfect time to get your home ready for winter and create the perfect place for entertaining your friends and family. And what better way to do it than with a stained glass fireplace screen for the living room or dining area of your Kansas City home! Stained glass fireplace screens are both an aesthetically pleasing and practical solution and are a sure way to charm your guests and visitors. Aspen Leaf Stained Glass For Your Kansas City Home! Fall is in full effect here in Kansas City and all across the Midwest for that matter. The days are getting shorter and the Autumn chill is in the air! Nearly everywhere you go you catch the smell of pumpkin spice coffee, cookies and more. A scent that intoxicates you with nostalgia; a scent as welcome as Fall itself. Best of all the leaves of the trees that line the streets of Kansas City are burning bright with color: red Maples, Orange oaks and, of course, and even some brilliant yellow Aspens. Here is Kansas it seems our Aspen Leaf stained glass pattern is a customer favorite. It is a wonderful addition to every home we put it on and can be a wonderful addition to yours as well and below are a few reasons why. In our many years of stained glass service to Kansas communities, one pattern that is wonderfully Kansas and has stood the test of time is our signature Aspen Leaf pattern and below are reasons it will fit well in your Kansas City home. Matches Any Decor: Although color can be added to this pattern, it typically uses clear and textured glass to create a beautiful masterpiece of dancing light. Because it is a stained glass window made with clear and textured glass it literally goes with any decor since there are no potentially clashing colors. Blends Well Your Kansas Surroundings: Kansas has a rich natural and wooded environment meaning Aspen leaf stained glass will blend seamlessly with the beauty that is already around us. Timeless Style: A stunning minimal and elegant such as our signature Aspen leaf pattern will always look good no matter what the style of the day! If you love our signature Aspen stained glass pattern and want to make it a lovely addition to your Kansas City home, contact Kansas City Stained Glass today for a free consultation and a speed estimate! Restore the vintage staircase landing/grand entry stained glass in your Kansas City home! If you’re fortunate enough to live in a historic home in that has a grand entry, you may also have a vintage stained glass window in your foyer or above your staircase landing. While vintage stained glass can make a stunning addition to a grand entry, it does require regular care and cleaning. In that case, you may want to consider stained glass restoration. Restoration can help rejuvenate the shine and color of your entry stained glass and make your Kansas City home look more elegant and polished.